The evil, multi-headed recoil monster from the ethereal netherworld raises its bloody, immortal fangs, clawing relentlessly year after year. Shotgunners are obsessed with recoil. Our obsession with recoil attains new heights every season. It is hard to find a new shotgun that does not make some claim about recoil. Indeed, the world's softest shooting shotgun is always for sale. Unfortunately, it comes from all kinds of manufacturers simultaneously. Not all of them have the same versions of the truth, apparently. So, what works? What really works? The notion that shotguns can be uncomfortable to shoot isn't a new one. Folks have been grousing about it ever since shotguns existed to kick us. To make matters worse, we just don't like heavy shotguns very much. John Brindle (Shotgun Shooting Techniques and Technology) noted that six to seven pound shotguns are in the area that makes the most sense for the generic application often called upland. Jack O'Connor wrote that he would never use a shotgun heavier than seven pounds for upland hunting and would rather have one closer to six pounds. W.W. Greener had his Rule of Ninety-Six, meaning that for comfortable shooting the shotgun should weigh at least ninety-six times the shotshell payload. Based on a six pound (ninety-six ounces) the maximum payload would be one ounce. A seven pound gun would be considered comfortable with no more than a 1.16g oz. payload. Greener's suggestion, based on about a 1200 fps load or thereabouts, has proven to be a very good one. If a one ounce, 1200 fps loud is extremely painful, then it may well be gunfit issues that are plaguing us more than anything else. Scaling the payload and velocity of the shotshell to the shotgun is classic, common-sense advice. It advice that we sometimes like to ignore, as sensible payloads and sensible velocities also dictate sensible hunting ranges as well. To get a 99% kill on mallards (or similar) that means 30 yards is it, based on the very extensive Winchester data. That 99% kill rate is based on an essentially perfect, center of the pattern hold as well. The problem with extended ranges is that payloads are not increased slightly to maintain lethality, they are upped dramatically. With the best loads of the day, the Lubaloy buffered Double X Magnum 1-7/8 oz. load of #4 shot, at 45 yards the kill rate was 97.6 percent with computerized center of pattern holds. Lethality potential scales directly with payload, but doubling the payload does not at all double the range. It normally doesn't due to the inability to populate a pattern. A one ounce load of #7-1/2 lead shot is about 346 pellets. At extreme ranges, we might well like the superior external ballistics and penetration of #2 shot. Problem is, doubling the payload to two full ounces of our lethal number 2s means only about 174 pellets, about half the pellet count of our original #7-1/2 load. To have the same pellet count, we would need a 4 ounce payload, something that could not be reasonably shoulder-fired. So, we have to compromise. Upping the payload in concert with pellet mass gives us better populated patterns and cleaner drops as ranges increase. Even to extend ranges moderately, we still need pleasingly plump payloads. You're away from home, and your shotgun kicks you. Your shoulder hurts. What will you do? What WILL you do? Back to the nasty thing called recoil. 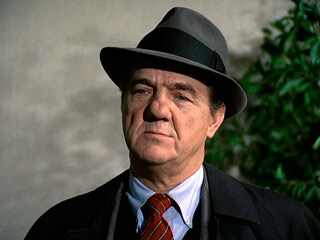 As Karl Malden used to say, What will you do, what will you do? We know that gas operated guns break up the recoil pulse by the addition of reverse recoil. Normal recoil is from the stuff blown down the tube. With a gas gun, we are blowing mass right back at our shoulders, in the form of gas, a gas piston, action rod, and bolt. All the physics that apply going away from us in the form of payload and ejecta also apply to mass moving in the opposite direction, right back at us. The fleeting counteracting force doesn't last for long, as we get popped again as the breechbolt comes to rest at the back of the receiver. It is a smaller pop, though, and the end result of all this is taking a nice big chunk off the top of peak skin pressure, the felt recoil phenom that we don't like. It isn't the end-all and get-all of recoil reduction all the time. As you'll quickly notice, many gas-operated autoloaders come with various wunderkind recoil pads as well. The A-5, properly set-up, is as soft-shooting as any gas-auto. The trick is to set it up so the massive forearm spring and friction piece can do its thing with minimum barrel speed. Today, we don't seem to like to bother with shotgun adjustments, either. Sportsmen like these good folks have been bravely fighting the recoil monster for years, sometimes equipped with only a thin piece of rubber as demonstrated above. The same is true for non-compensating gas actions, the 1100, the 303, the Browning B-80. Within a narrow range, they are supremely soft shooters. Higher bolt speeds and we quickly get a more and more noticeable pop at the back end. Both the Beretta A390 and Browning Gold / Silver autos do a better job of adjusting to loads, with the Browning Gold (and related actions) generally the softest shooting. The recently introduced Beretta A400 has a violently fast bolt speed. Good for reliability in the low range of load intensity, but not achieving any great advance in softness of the action. What about recoil pads? Yes, they sure do help soften things out. Kick-Eez and Limbsaver pads are both good, with the Pachmayr pads very good as well, perhaps a small notch back in comfort. Marketing lies are one thing, of course, but the claims seem to be quite a bit different when applying for a patent. Referring to USPO #6,305,115 ostensibly for the Remington SuperCell Pad, you quickly get the feeling that the SuperCell isn't all that super. It isn't, offering a 6% reduction in recoil with turkey loads over no pad at all. With target loads, a more respectable 19% is claimed. Yet, versus common vented rubber pads, some shooters could tell no difference at all. It sounds like more of a pooper than super and so it is. Human beings aren't exactly machines and are ill-equipped to precisely measure the recoil event that happens within about six milliseconds. Did that last shell feel more like 25 or 35 ft.-lbs.? Unfortunately, this tends to make claims hard to disprove. It is compounded a bit by junk science. 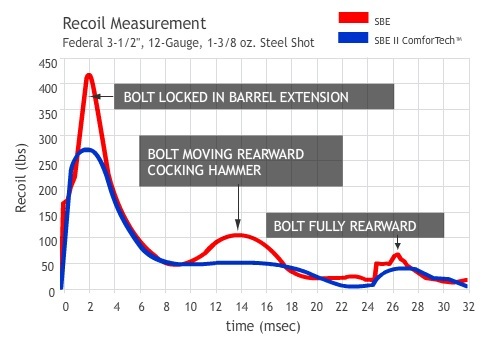 Recoil can be measured against fixtures, but that isn't at all the way we use shotguns, we of course use human shoulders. 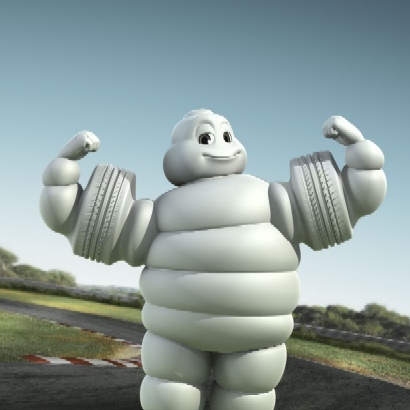 The Michelin Man is very well-equipped to deal with recoil, but I'd rather not use a shotgun that has parts of him hanging off of it. There is one approach that does work well without destroying the dynamics of the shotgun. That is the Benelli ComforTech stock. I've tested ComforTech-equipped SBE-II, Vinci, M2, and Super-Novas recently. The ComforTech effect is most profound as loud intensity goes up, right where you need it the most. It is most apparent to me in the Vinci 12 gauges and the M2 20 gauge. The ComforTech is also covered by patent which gives a better idea of how the system works: U.S. Patent #6,834,455 of December 28, 2004, which describes the ComforTech stock and its five claims. Is it true? Actually, yes, based on shoulder-fired testing with one Federal heavy waterfowl load. It likely won't be representative for every single load you can chamber, for the ComforTech operates best at the low and high intensity ends of the scale. I was surprised at the pattern board when using 1-5/16 oz. Federal three inch 20 gauge loads that the six pound Benelli M2 didn't pound me into the ground like a tent-stake. It was amazingly comfortable to shoot with these heavy-for-gauge loads. Quite a bit softer than Beretta A391, A303, or Browning B-80 gas guns, the A391 being the harshest kicker of the lot with this load. With 1 oz. 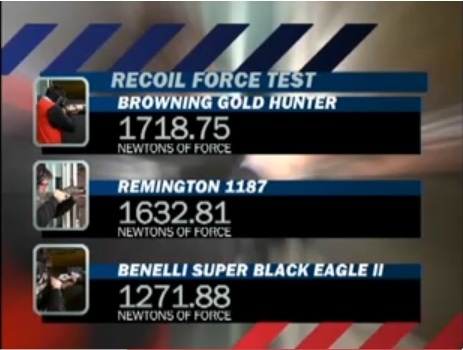 1220 fps Federal loads, the half-pound heavier Browning was the soft-shooting champ, followed by the Benelli, but the Benelli M2 scaled well with the heavy three inch loads, where the B-80 didn't. Naturally, I wondered why as I was naturally using a smaller gas-ported three-inch B-80 barrel, and had updated the B-80 with a magnum mainspring, an AL-2 spring which was the longest and heaviest I could find. Manufacturers tend to use a lot of graphs that sometimes look like droodles. Benelli's is different, in that it is actually based on some testing with humans. The answer lies in the ComforTech stock and its recoil pad. The Benelli recoil pad is very, very soft. As I understand it, it is designed for rapid compression with target loads of the common 7/8 oz. variety to give maximum recoil attenuation at the low end of the scale. After that point, particularly in the case of the three-inch loads, the ComforTech stock begins to act like one giant recoil pad on its own. 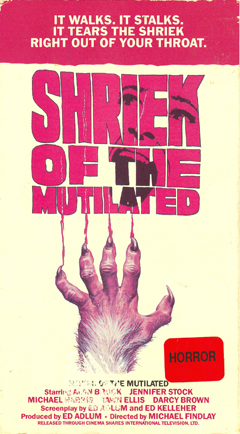 Compressing primarily at the top, where it is largely cut-out, the entire stock compresses slightly into itself. The stock counteracts the normal muzzle rise with vertically downward recoil force that it generates as it decompresses. This is where the apparent lack of muzzle rise and quick follow-up shots come from. It is a simple system with no extra weight, springs, rubber tires, or super bouncy feel. It works, operating at its best on the low and high ends of the scale. It doesn't affect the balance of the gun. When you do get a chance to try a ComforTech-equipped Benelli, like the M2 above or the Vinci with the second-generation ComforTech, make sure you give it ago with heavier loads. You'll be able to tell the difference right away. Certainly, Benelli has several models, some far more traditional looking than those that are ComforTech-equipped. If you shoot a lot or shoot peppy loads, you might want to think twice before you pass up the ComforTech models. They work far better than I would have ever believed.